There must be a ton of money in social media. Why else would Google (whom I've blogged about a lot lately, it seems) create a direct competitor to Facebook? The service is called Google+ and it attempts to improve upon Facebook with the idea of "Circles". The idea is a pretty good one, in my opinion. While Facebook lumps all of your "friends" into a single category, Google+ allows you to have "circles" composed of work contacts, true friends, family, etc. This allows you to send info to some circles and not to others. This allows you to have better control over your privacy... well if you'd prefer that your boss not see those pictures. There is also "Hangouts" which allow for multi-person video chats with members of your Circle. Then there is "Huddle" which seems to be designed for mobility and group messaging. The idea seems to be a way to let people know where you are going to be by sending group messages, a little like Twitter, it seems to me. Google+ is not yet available to the public, but those with accounts can now send email invitations to friends. I'd love to give this a try. If you have an invite to give away, send it to me? Here is a cool idea from the makers of those nifty little GPS units. One of the things I've learned to love about my Chevy Tahoe is the backup camera. You know, put the car in reverse and a section of the dashboard changes over so that you can actually see behind you as you backup. It's a great safety feature, but not everyone wants to have to buy a new vehicle to get it. SANTA CLARA, Calif. (22 June, 2011) /PRNewswire/ – Magellan GPS today announced the launch of a Back-Up Camera companion product for its RoadMate® safety series car navigation units that will help drivers reverse and park more safely. Combining this camera with a Safety Series GPS navigator expands Magellan's focus on safety and security to the full time you are in your car. It starts when the Back-Up Camera helps you safely reverse out of your driveway, continues through your commute with premium GPS navigation features, and does not end until the Back-Up Camera helps you park the car without damage or stress and you finally shut off the ignition. The Magellan Wireless Back-Up Camera attaches to the vehicle's rear license plate and transmits images directly to the expansive 7" high resolution screen of a RoadMate 1700 or RoadMate 9055 GPS device. When the car is put into reverse, the GPS navigator will switch from map to rear-view mode, enabling drivers to view what is below the rear window. The Back-Up Camera is both dustproof and waterproof to IP67 standard, and features a wide-angle viewing lens that provides a 120-degree viewing area behind the vehicle. The transmitter, which sits in the car's trunk, is also water resistant (to IPX4 standard). With a 45-foot range and a 45 degree camera vertical adjustment, the transmitter is adaptable for most vehicles, SUVs and RVs. "The Magellan Wireless Back-Up Camera adds a substantial level of safety and security to your drive. Back-Up Cameras have proven to be useful devices in helping drivers get a more complete picture of what's behind them – such as small children or pets in the driveway – and helping them back into narrow, parallel parking spots. Combined with the confidence that a navigation device provides, the RoadMate with Back-Up Camera help you leave, arrive and park safely," said Mike Wagner, Senior Director, Product Marketing for Magellan GPS. The Magellan Wireless Back-Up Camera kit comes complete with a license plate mountable camera, transmitter, wireless receiver, vehicle power adapter, installation hardware, and instructions. It is available at Amazon.com and automotive specialty shops, and retails at a MSRP of $149.99. It seems the folks at Google have evidently been raising some red flags over at the FTC & it looks like a formal FTC inquiry is on the way. They want to make sure that Google is not sending all those searches to its own services & not sharing them with similar services offered by competitors. Very similar to what the big G encountered in Europe. With Lion ready to roar right around the corner, Apple has released one more update. It's not Earth shattering, just some minor bug fixes and a bit more removal of that MacDefender mess. I have it on good authority from multiple sources in the industry that later this summer, laser manufacturer AMD will be purchased by Dentsply. The laser line, it is rumored, will be sold thru their Tulsa Dental Division. AMD came to market a few years ago with a great price point on a diode laser and drove industry laser prices down while simultaneously driving industry interest in lasers through the roof. After establishing a nice foothold in the market, rumors began to swirl that someone bigger would be buying the company. Dentsply is holding off on making the announcement so they can focus on the very important news of their acquisition of Astra Tech which occurred which occurred this week. It now appears that the "someone" is Dentsply. Interesting times indeed! Today, I spent some time on the phone with Paul Hinman, the President of Liptak Dental Sevices. They are a dental only IT company that has created a rather unique backup system. It is composed of an onsite Linux powered backup hard drive that creates a mirrored backup of your server several times throughout the day. This info is also sent out "to the cloud" to provide a secondary mirrored backup on a secure server that is housed in a secure offsite location. The backups are routinely checked for consistency and you are alerted if anything goes wrong. Paul was so convincing, I've agreed to try the system out for myself. Once the hardware arrives, I'll be blogging about how it's going and how it works on a regular basis. Stay tuned for all the updates. For more info on the service, click here. It is with great pleasure that i announce the arrival of my Orascoptic Freedom LED light system. For years I have worn the most powerful Orascoptic surgical telescope setup. It's composed of 4.8 TTL (thru the lens) mounted telescopes. As you go up in magnification, the amount of ambient light that reaches the eyes is decreased, so auxiliary lighting becomes very important. Up to this point, I've used auxiliary lighting systems that functioned well, but required a battery pack that I had to carry somewhere on me. Usually it was in a pocket of my S.C.R.U.B.S. cargo pants, but I know for a lot of you, it is something you carry on your waistband which isn't the most comfortable solution. Now the Orascoptic Freedom can change all that. This is the first device where the batteries are actually part of the glasses. The paddles over the ear pieces pictured above are the batteries that power the system. The weight of the batteries also helps take the weight of the telescopes off of the nose. ♣Increase Productivity or Reduce Frustration, why not have both? - Lightweight battery pods that connect to the temple arms of the loupe, eliminating the heavy and/or cumbersome belt-packs employed by traditional LED systems. Additionally the temple arm-mounted battery pods eliminate the issue with traditional long dangling electrical cords that are prone to getting caught on chairs, doorknobs, and cabinets in the dental office. ♣Security in keeping it Simple - A robust yet innovatively simple universal mounting clip securely fastens the lightweight headlight to virtually any TTL loupe on the market. ♣Unparalleled Usability, Confident Clean-ability - Innovative capacitive touch technology eliminates the need for any buttons, knobs, or switches, but more importantly allows the practitioner to control/set the light intensity while holding instruments in both hands. Capacitive touch also eliminates bacteria traps associated with traditional light system controls, making the Freedom easy sanitize and maintain. ♣Better Comfort & Balance = Less Fatigue - Unique weight-neutralizing counter-balance between the battery pods and the headlight. Weight disbursement can be customized to relieve the forward pressure on the nose from the magnification / oculars in your loupe. Freedom is both convenient and powerful, providing illumination intensity settings from 1,000 to 4,000 foot candles. Orascoptic Freedom will enable better clinical outcomes for you through superior visualization, and ultimately your patients, through optimal illumination…unleashed. OSspray, Inc. is pleased to announce the newly improved Sylc Prophy Therapy with SmarTip Technology System that delivers consistent performance and increased ergonomics. Available in June 2011, the improvements will allow clinicians to use the unit dose SmarTip Technology System with confidence and greater efficacy while at the same time deliverign the innovative Sylc therapeutic prophy treatment. And the best news is that OSspray is passing along all the improvements without increasing the retail price to your dental offices! Integrated pressure regulator ro the SmarTip Adapter - this unique feature eliminates the need to adjust air pressure which provides a more consistent delivery of Sylc Therapeutic Prophy Powder. Shortened Tip Length - this design enhancement to the back-end of the blister tip provides increased ergonomics for improved fulcrum and access inside the oral cavity during treatment. More robust collar - the collar improvement ensures a secure prophy tip engagement to the SmarTip adapter. Sylc SmarTip combined with Sylc Therapeutic Prophy Powder is the only system that removes mile to moderate stains, desensitizes, and restores the tooth structure to create an enamel like layer for long term protection from acid challenges in one simple procedure. The SmarTip Adapter with integrated pressure regulator is backed with a 2-year manufacturer's warranty, providing dentists and hygienists piece of mind. 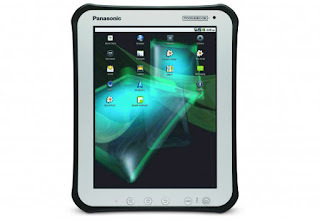 For years, Panasonic has been famous for their Toughbook line of nearly indestructible notebook computers. Now with the surge in people using tablet devices, Panasonic has created an Android based device that is designed to take a beating on a regular basis. There are not many details yet available on this device, but instead of being a touchscreen like other tablet/slate devices, this one will be run with a stylus which should help since this type of device is designed to be used in areas where thick gloves and other protective gear may be the norm. It also will have an XGA display instead of the glossy types we are used to seeing. Panasonic is doing this to improve viewing in areas of bright sunlight since these devices will also see frequent use in the great outdoors. Potential time to market is fourth quarter with no word on pricing. I was browsing the Cnet website and came across the graphic above. The Smartphone wars have had an interesting shakedown and, at least for the last 6 months or so, it's been breaking down into a 2 OS race. Apple and Google have begun to really take over the market and continue to show growth... mainly at the expense of other operating systems. A few months ago, I wrote about how Android had moved into the number one position and now Android & Apple seem to be distancing themselves. Now this isn't a raging endorsement of either platform. Innovation routinely means that someone can make a tremendous surge or a brand new thought process can come along and totally change the status quo. However, what it does mean is that for the time being it's a Google & Apple kind of world. I personally find it interesting that Apple at one time was number one, but through their policy of limited hardware (like their computers) they've now been overtaken by Google who allows their OS to be run on many different hardware platforms (like Microsoft did with Windows). Now granted, Apple may be fine with this since they are obviously doing well in this sector, but it does remind me of the early days of the PC. As I've said before, I'm a Mac guy and have been for about 6 years now. I'm a big fan of Apple products and own quite a few of them. However, due to their limited distribution of the iPhone, they forced me to buy a Samsung phone running the Android OS. I mean, I'm the Apple target market, but because they did not have a deal in place with Sprint, I bought the Epic 4G instead of the iPhone. i'm loyal to those who are loyal to me and I have quite a few Sprint employees in my practice. The Smartphone market continues to expand. Heck, The History Channel is currently running a show on the top tech devices of all time and it has the Smartphone as #!. Google, starting late in the game, has done a tremendous job of catching Apple. I'm excited to see what the next 6 months bring. The age of a "cashless society" is upon us. Of course, maybe it's just a "walletless society", but nonetheless there seems to be fewer and fewer reasons to actually carry cash or a checkbook these days. I remember being in the Salt Lake City airport shortly after the 2000 Olympics and i saw the vending machines all had Ethernet connections & you could swipe a credit card in them. Obviously this was a necessity when you got tons of travelers coming through that don't have US Currency (possibly not even speaking English) and still want a Coke. Being able to swipe & go was a tremendous service to offer these visiting travelers, not to mention a (most likely) cash cow for the vending machine companies. Heck, I bought a Coke from one of the machines just because I wanted to say I'd done it. It's not always inexpensive being a traveling geek! Anyway, now with credit & debit cards a lot of folks really aren't carrying much cash these days. I personally can't remember the last time I carried a check book either. Well, this is all taking an even more techie turn as smart phones get into the fray of this as well. As an example, let's take a look at my favorite coffee company, Starbucks. One of the neat marketing things Starbucks does is the concept of your "own" coffee card. Someone can give you one or you can get one for yourself. It's a gift card that can then be registered to a certain user (you) and then reloaded with cash whenever the balance gets low. By having a card tied to you by registering it through the Starbucks website, the owner's coffee habits can be tracked and Starbucks assigns "points" for purchases. It's a great way for the company to ensure loyalty and the consumer gets some perks as well. In January, the company released an App through the Apple App Store that allowed the consumer to put in their Starbucks Card number and then use the app to charge/pay for the purchases... even if the buyer didn't have their card with them. This made Starbucks truly cashless. It also meant that more and more people began locking themselves into a card since they could reload it at their leisure and didn't have to worry about having cash or their card with them. The bummer part of the deal came when no Android App showed up. Trust me when I say, "Geeks drink coffee." i know of what I speak. Geeks also use phones other than those made by Apple. So, anyway today Starbucks announced that they have an Android App that mimics what iPhone users have had for 6 months now. However, you don't have to use this new app if you don't want to. Because there was a need and no solution by Starbucks, an app called My Coffee Card. This amazing and FREE app allows you to charge your purchases by creating an onscreen barcode that can be scanned by the cash register. It also tracks your spending and stores your receipts. This receipt/account function is so fast that I can pay for my coffee using the app, check my balance, and have the updated/current balance on the screen before my coffee is in my hand. You can also use it to reload your card using a secure connection where you simply punch in your credit card number and then tell it how much you want to put on the card. Heck, it even has a Starbucks locator for those of us who travel. I've been using My Coffee Card since the early part of 2011 and I can't say enough good things about it. In fact, it does such a great job, I'm not quite sure why Starbucks bothered to bring out an app after 6 months of not having one. Now just to be fair, I did download the "official" Starbucks app today and I'm going to give it a try, but honestly it's going to have to really sweep me off my feet to get me to give up my beloved My Coffee Card. I've been a Mac guy for about 5-6 years now. One of the biggest reasons I was pushed away from Windows? Plain & simple it was reliability. I just got tired of crashes & blue screens of death (BOD). However, this December I needed a new computer at my desk in the office. Since we're an Eaglesoft office, I needed a new machine that ran Windows, and since I do 3D patient imaging with my Gendex GX CB-500HD I needed a machine that was blazing fast and had tons of memory so that I could quickly and efficiently review the scans we take. So I called up my good friends at Goetze Dental and had their IT department put together a dream Windows machine. The computer is running Windows 7 64 bit and has 8GB of RAM. What I had gotten used to in the old Windows world had been pretty much eliminated in Windows 7. In the 6 months I've had the new box, I've had ONE severe crash that resulted in a reboot. Now I'm still not as big a fan of Windows as I am of Mac, but Windows 7 is a really nice operating system. I certainly can't tell people to stay away from it because of usability issues. It is fast, stable, and easy to use. Now comes word that the next generation of Windows will be available in about 15 months. Windows 8 promises to be a beauty to behold. It will run on tablets, phones, desktops, and notebooks making it an identical experience (more or less) no matter what device you happen to be using. According to Dan'l Lewin of Microsoft, “I think tablets are big phones, more or less and I think they will want, over time, some of the capabilities that PC architectures have.” At this point I think his logic makes perfect sense. So here's hoping that Windows 8 is as bit a plus as Windows 7. Microsoft really needed an OS that worked well and they created it. I'm pretty confident that 8 will be a similar success. Ken Clarke Appointed General Manager of OralDNA® Labs Inc.
Brentwood, TN – June 9th, 2011 – OralDNA® Labs Inc. (OralDNA.com), leaders in advancing wellness in dentistry through salivary diagnostics, and a subsidiary of Quest Diagnostics® (NYSE: DGX), recently appointed Ken Clarke as General Manager. He will report to Dermot Shorten, Vice President, Office of the Chairman, and will be based in Brentwood, Tennessee. Prior to the creation of OralDNA in 2008, Ken provided strategic planning and project implementation services for major hospitals and medical laboratories through Clarke Consulting, which he led from 2006 through 2007 in Nashville, TN. Before that, Ken served as Vice President of Operations for LabOne in Cincinnati, OH, where he managed a centralized laboratory and six hospital laboratories. Ken has also worked as Administrative Director of the Pathology Laboratories at Northwestern Memorial Hospital, a major academic hospital in the Chicago area. Ken received a bachelor’s degree from Vanderbilt University and master’s degrees in healthcare administration and business administration from Washington University in St. Louis, MO. This announcement comes just months after OralDNA Labs appointed dental industry veteran Michael Dunn to the newly created position of Vice President of Marketing. Dunn was most recently the Sales & Marketing Director for CDB Corporation, the leading OEM supplier of ceramic and composite orthodontic brackets. Prior to CDB Corporation, he held various marketing posts over several years at Sirona Dental Systems, including Director of Marketing, CAD/CAM Systems. He is a graduate of the University of North Carolina at Charlotte, where he earned a BA in mathematics. Imagine the following scenario: Someone steals one of your computers. However, you are security conscious & have the BIOS password protected. This means that the system will not even begin to boot until the correct password is given. This is pretty good security until the thief removes the hard drive and puts it in a different machine or a portable hard drive enclosure where it will be treated as an auxiliary drive. Once that happens, your data is plain to see. However, Toshiba has put a wrinkle in the above scenario with hard drives that will totally wipe themselves clean if they are connected to a different machine. These Self Erasing Drives or SED for short encrypts all data on the drive & then unecrypts it when ever access is needed. If the drive is accessed by another machine, the drive senses this and destroys the keys. This leaves the data encrypted with a 256-bit AES algorithm and no way to decode it. For the full low-down, check out Toshiba's site. In our ever vigilant world of prevention, you can't be too careful. Cancer is one of those diseases that it is so much easier to avoid than to deal with once you have it. WebMD has a listing of 8 new potential carcinogens. Two are listed as known carcinogens while 6 are listed as "reasonably anticipated to be carcinogens". For the full article, head on over to WebMD. The people at Archos make some pretty sweet hardware. I've been a fan of theirs since they began to compete with hard drive based iPods in the early part of the 2000's. Now the smart people at Archos have come up with a tablet device that will actually run Windows. The Archos 9 features 32GB SSD (solid state hard drive with no "hard drive" moving parts), a built-in webcam, WiFi, stereo speakers, microphone, USB port, and Bluetooth. It provides a "real" Windows 7 experience and gets 5 hours of battery life from a single charge. It also comes with a spare battery so you are not limited by the 5 hours. It will connect to peripherals like cameras and printers via USB and has a 1080p output that can be connected to other video outputs. Combine that with the $499 price tag and this is a pretty nice Windows machine. While many of us love to read books on Kindles, Nooks, and tablet devices, we've been more or less forced to read what the sellers in our respective online stores will sell us. Not that I'm complaining, but what I mean by that comment is that if I have a Kindle, I can only read what Amazon has in the Kindle store, etc. Now in most instances, this is great. If you read for pleasure or personal growth, the device stores has more titles than you could consume in a lifetime. Oh, and I *love* being able to read a book on my Kindle, my Xoom, and/or my iPad. It's a great way to read and I love being able to highlight, make notes, dog ear pages, and all the other fun stuff you can do. The only real drawback? You can't read textbooks. That can be a pain to those of us who are professionals and continue to use textbooks as reference materials. Well, that is now changing thanks to Kno. The concept is a nice one. Kno is an app for the iPad and also an online store with over 70,000 (yes... 70,000) textbooks. Just download and install the app from the Apple App Store, go to the store, buy your textbook, and start reading. While I haven't had a chance to review the store... yet, you can bet I will be doing so in the near future. I'm already lightening my load by letting Lexicomp put 15 drug and medical reference textbooks on my Xoom and iPad. Soon, I may also be carrying a huge reference library of my favorite textbooks courtesy of Kno. Check them out and then post a comment!